International Journal of Research in Health Sciences,2014,2,4,1172-1179. 1Assistant professor, Dept of Anaesthesiology, RajaRajeswari medical college and hospital, Bengaluru, Karnataka, INDIA. 2Professor and Head of Department, Dept Of Anaesthesiology, Adichunchanagiri Institute of Medical Sciences, Mandya District, Karnataka, INDIA. 3Assistant professor, Dept of Anaesthesiology, M.S.Ramaiah Medical College Research Institute, Bengaluru, Karnataka, INDIA. 4Assistant Professor, Dept of Community Medicine, PESIMSR, Kuppam, Andhra Prdesh, INDIA. Objective: To compare the clinical effects of 2.2ml of 0.75% intrathecal isobaric Ropivacaine with 2.2ml of 0.5% isobaric Bupivacaine for elective lower abdominal/limb surgeries. Materials and methods: A prospective randomized controlled double blind study. 60 patients were randomly selected for the study and are divided into two groups of 30 each. 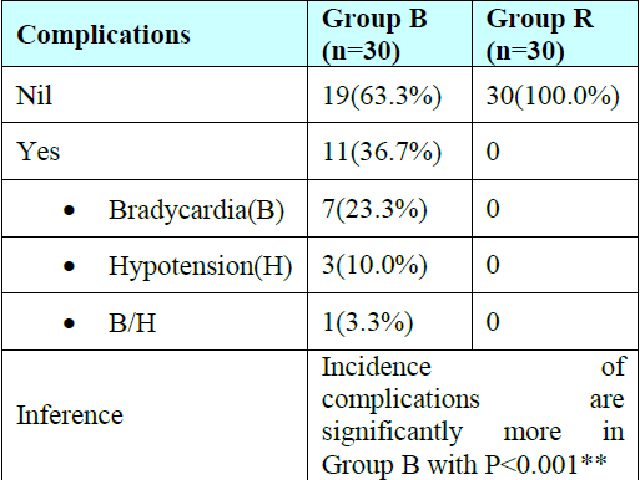 Group B patients received 2.2ml of 0.5% isobaric Bupivacaine intrathecally. Group R patients received 2.2ml of 0.75% isobaric Ropivacaine intrathecally. Onset, maximum level and duration of sensory block. Onset and maximum duration of motor block, hemodynamic parameters and adverse effects if any were studied. Results: There was significant difference between the two groups in mean time to onset of sensory block at L1, 158.40±41.89sec with Bupivacaine and 174.00±44.12sec with Ropivacaine, (P 0.073+). Maximum sensory height attained was comparable in both the groups being T8. Total duration of sensory block was 182.67±20.29 min in group B and 190.33±9.3min in group R, which is significant.(P). Mean time of onset of complete motor block was 3 min in group B and 10-15 min group R (p<0.001). Duration of motor block was 218.50±19.17min in group B and 149.00±3.81 min in group R which is clinically and statistically significant (P<0.001). Hemodynamic parameters and side effects were comparable in both groups. Conclusion: Ropivacaine 16.5 mg (2.2 ml of 0.75% isobaric Ropivacaine) provides comparable quality of sensory block but has slower onset and significantly shorter duration of motor block and better hemodynamic stability compared to Bupivacaine.